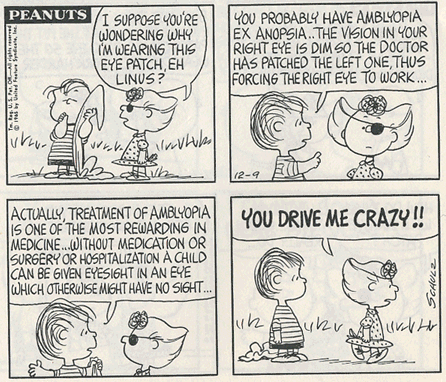 Amblyopia (aka lazy eye) came up as a topic of conversation yesterday, and I was able to input that the eye-patch treatment of amblyopia is one of the most rewarding in medicine. This is because without medication or surgery or hospitalization a child can be given eyesight in an eye which otherwise might have no sight. Thank you Charles Schulz, Linus van Pelt, and Sally Brown. My quick trip to Kansas City went well, select pictures are in an album.